Event overview: R&D tax credits for architects. It was a pleasure to host another breakfast roundtable last week for a group of London’s most inventive and pioneering architects. Get in touch if you'd like to attend our next event! At our latest breakfast roundtable for architects, there were attendees from larger practices looking for guidance on how to improve their claims and others from smaller firms who had heard of R&D tax credits but were unsure which of their projects were eligible. As a start, I provided some background information on the innovation incentives available to architects. Those practices that were unfamiliar with the scheme wanted to know more about what was involved in the claims process so we discussed the documentation required, which accounting periods could be claimed and the benefits R&D tax credits provide. We also discussed what size a practice needs to be in order to benefit from the tax relief. This highlighted that the scheme is not just for larger firms but also identified how projects funded by a third party can be claimed under the large company scheme. Attendees gained further understanding of which of their projects are eligible for R&D tax credits as we discussed the application of new materials, new construction methods and solar thermal cladding. This was put into perspective as a larger practice shared their own experience and highlighted projects that they had successfully claimed for in the past. There was uncertainty around how to claim projects undertaken for the benefit of the practice rather than focused on one specific building and a number of questions arose around claiming Building Information Modelling (BIM). Many firms have a specialist who develops scripts and libraries to support the use of BIM technology so we discussed how the claim would need to separate routine support activities from development of tools when making the claim and how these two different activities might be claimable under the scheme. HMRC are looking to make changes that will decrease the length of documents they review in support of R&D tax credits. This will help to reduce the time it takes to create the documentation in support of a claim but is not yet confirmed so we also highlighted the current project coverage requirements. As a recommendation, we suggested that the attendees follow the HMRC online form as a basis, but work with an experienced advisor in order to include the relevant information and submit claims efficiently and successfully. I concluded the session by sharing the secrets to positive interaction with HMRC and provided some solutions to the common challenges architects face when claiming R&D tax credits. It was a thoroughly enjoyable morning and I am looking forward to working with these architects in the future. Interested in attending our next event? If you would like to attend our next roundtable or if you’re an architect yourself and have any questions around R&D tax credits please get in touch. You might also be interested in… R&D tax credits. We understand that pushing through a breakthrough or advance can be a real grind. You need all the help you can get. Gaining R&D credits can help keep business ticking over while you create, fine-tune and fine-tune again. Submitting a successful claim - free download! Making a successful claim takes a nose for detail. When you work with our dedicated R&D tax credits team, you can count on that. We know exactly what HMRC want to know - we’ve worked with them on complex claims and understand what they need and more importantly why they need certain information - and can make sure you share exactly the right details to satisfy their requirements. 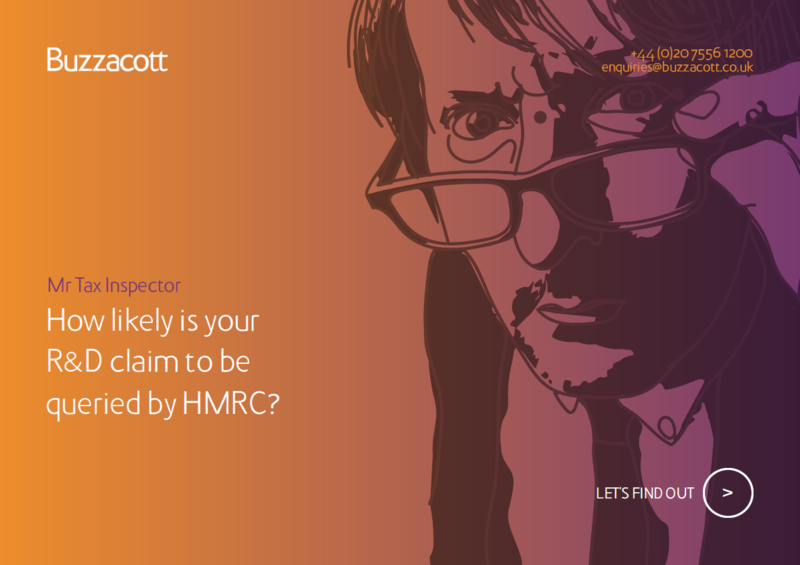 Download our free Mr Tax Inspector guide below to find out how to improve your R&D claims and keep HMRC on side. New to R&D tax credits? A lot of businesses don’t claim as their engineers, developers or scientists are not aware that their projects are eligible. Our job is to get these individuals to open up and tell us about the problems and challenges on their project, and explain the clever ideas they came up with to find a solution. Get them talking to someone who understands their language and soon you end up with eligible projects popping up all over the place. Take a look at our free guide below to find out if you're eligible to claim. Fill out the form below to talk to our R&D tax specialists about tax credits. What are you waiting for? You’ll boost your future prospects. As an architect, you may not know when you’re undertaking activities that are eligible for R&D tax credits. However,… Read more R&D tax credits for architects – what should you know?